A popular space-saving device is the sector plate — a track or tracks mounted on a board that is pivoted at one end so it can match up with several approaching tracks. Here are some micro layouts that take advantage of this clever device to provide excellent operating capability. 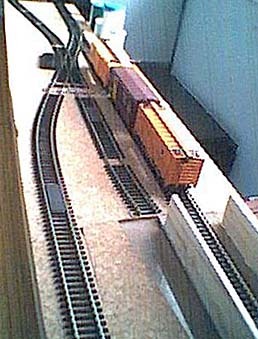 Jack Trollope’s design for the HO/OO Lesana Yard (it’s 35 inches long) represents part of a busy switching yard. The left half of the yard is “offstage”, where a sector plate serves the tracks of the runaround loop–invisibly acting as part of the operating pattern. Jack’s ingenious idea to use a mini-plug (from the stereo store) as the pivot and current carrier for the sector plate is described at the top of the plan. Notice also that the plate is pivoted, not at the end but slightly off center, allowing some of its length to project beyond the actual boundary of the layout during operations. This space-saving dodge could be used in many other plans as well! Jack Trollope used the same “trick” of pivoting the sector plate near its middle in his now-classic Box Street Yard layout. Running modern image U.S. trains, Box Street uses a minimum of turnouts (total of two!) and a maximum of ingenuity to provide a convincing industrial district with plenty of switching or shunting opportunities. Jack uses the sector plate to complete the runaround siding (loop) thus achieving excellent access to spur tracks running in both directions. These under-construction photos show that this compact yard looks as good in layout form as it does on paper! It isn’t often that I encounter a truly new idea in model railroading, but Emrys Hopkins has come up with one! It’s the amazing 3D Sector Plate, featured in this layout, the Aardvark Never Killed Anyone Tramway. More of a demonstration design than an actual working layout, the ANKAT line is suitable for Gn15, 1n20, On30, Sn42, and HO scales. It features operations on three separate levels, all joined by the Vertical Sector Plate. And here are the details of the plate design. 1. The longer the sleeve around the rod, the better the stability of the plate. 2. It’s much easier to use the plate if the tracks get progressively lower as they approach the operator. 3.. Be sure to allow space for the blocks on which the plate rests when you are designing the angle at which the next level will leave the plate. This design factor limits the number of separate levels that can be accommodated. We’ll be very interested to see and publish photos of the first successful 3D Sector Plate installation. And the Gallery welcomes further micro layout plans using this innovative device! By way of contrast, in a 48″x12″ (120×30 cm) space using 16.5mm gauge, Emrys has concocted an industrial switching/shunting area, a marshalling yard , and a large engine depot with plenty of storage and workshop space. An impressive feat! This hard-working little layout can be built in scales ranging from Gn15, 1n20, and On30, to standard gauge OO and HO, as well as (by narrowing the gauge) On2, HOn30, HOn3, and HOn2 — and perhaps others. If there ever were a layout that was too modestly named, this is it! Notice that in both plans, this layout has one of the most ingenious runaround arrangements I’ve ever seen … one end is a turntable, and the other is a sector plate! For more of Emrys Hopkins’s work, search his name in this site’s Index or go to his website. Or do both! 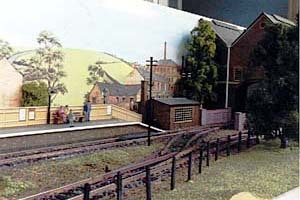 Terry Allen’s switching layout, “Titchfield,” has been seen on the English exhibition circuit. Terry has very kindly allowed me to “squeeze” his design down into a micro layout size, presented here as Lesser Titchfield. Differences from the original 54″x15″ (137×38 cm) layout are mainly the substitution of a three-way turnout for two lefthand turnouts (to save length) and the loss of some valuable scenery space. The operating pattern is identical to the original which could been seen at Terry’s website. This “shrunken” micro version is designed to fit on a standard 110x26x5 cm (43″x10″x2″) IKEA shelf unit, from their LACK range. The shelf comes with invisible self-mounting hardware (no brackets! ), so the railroad will seem to float in front of the wall wherever you want it. Recommended mounting height is chest high on the owner. For exhibitions, the shelf is simply taken down, carried under an arm to the hall, and placed on a standard table. The sector plate is concealed within a warehouse shell and is accessible from the rear. 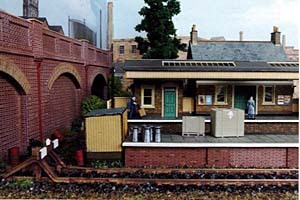 The station building, platform and signal box will have to be background flats or very-low-relief sttructures in this micro layout version. The pictures below show the flavor of this well-done layout. Terry points out that the rolling stock involved is minimal. A full schedule can be run with one loco, one small 4 or 6 wheeled coach, one brake van (caboose), and a small collection of wagons (short, 4-wheeled freight cars). It isn’t often that I come across an example of shrinking a micro design to even smaller dimensions–but here’s a good one! Jack Trollope’s Box Street Yard plan has become a modern classic design. It uses a minimum number of turnouts (two) to create a convincing industrial district with plenty of switching or shunting opportunities in an area of only 66″x8″ (in HO or OO). Originally designed to fit into a small, wooden gift box, the plan has become popular around the world among micro layout builders. Now Jeff Hartmann, from Long Beach, California, has found a way to shrink the Box Street Yard plan down to 36″x12″! Boxer Shortline preserves the switching freedom of the original line and finds a space-saving geometry besides. In both plans, the hidden sector plate is the “secret weapon” that makes the plan work and allows maximum operations in a bare minimum of space. As shown, the little road is surrounded by industrial buildings, representing the heart of an inner-city switching district. Naturally, many other scenery plans are possible. This is a standard-gauge HO/OO railway using Peco turnouts … but you will probably need very small locomotives and short, four-wheeled industrial type cars. There’s a photo of Jeff’s 36″x9″ mockup in the Small Layout Scrapbook section of this site … he plans to use old-time U.S. rolling stock (which was relatively short) to save space. Rub Down Your Raptor, Sir? Jeff Semprebon, from New Hampshire, has come up with a new way to hide a sector plate — he wants to build dinosaur pens atop it as part of a “Jurassic Park” style setting, with a twist. Presenting Mesozoic Park – Maintenance Compound A! Jeff describes it like this: “I had long thought of a Jurassic Park type railway, with trains rather than Ford Explorers to carry the tourists along. Looking through the Micro Layout Design Gallery, it occurred to me that a maintenance area with some holding pens would provide a much more interesting setting than the actual tour line. “Hence, this area combines a couple of veterinary pens where Park dinosaurs are held if sick, along with maintenance/storage tracks for switching various cars needed to bring in supplies from the dock and to make repairs to keep the park operating. An open area could be used for a holding pen for additional small dinosaurs on their way into the park from ‘Site B’. “This plan is adapted from Jack Trollope’s Lesana Yard, hiding the sector plate under a couple of raised pens for smaller dinosaurs. The larger pen is sized for a Tamiya 1:35 triceratops or similarly sized creature. Supplies are brought up at front left from the dock, with the engine pushing the car(s) to prevent runaways on the offstage slope. The shed serves to store supplies, perhaps haybales for the park’s herbivores, and cassettes could be employed here to allow some additional switching opportunities. Great idea for a busy small railway, and a super way to involve children of “that certain age” in the layout!